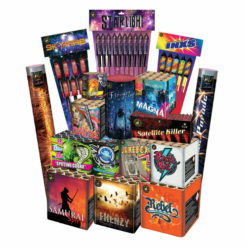 This exciting pack is crammed full of larger display fireworks designed to create a big impact high quality display, with mega barrages and awesome effect rockets. Save £166 off our already discounted prices! No weather warning needed for this Monsoon Blast. 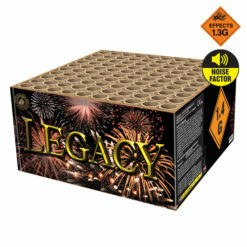 A stunning and energetic 50 shot verticle firing barrage. Heading skyward with scorching pace a constant flurry corkscrewing crackle tails burst into the air. Before forcefully erupting into excellent green and blue peonies with gold crackling bouquets. Before giving way to stunning red peonies and crackling stars breaks. Silence is not golden, with the booming Brocade Crown with Brocade Mine. This impressive 25 shot 25mm professional effect barrage is astonishing. With stunning brocade crown glitter mines and gold tails. Leading to phenomenal brocade crown bouquets. Why not give the Silver Spinner to Red Blink a spin around the block. This 25 shot 25mm is a loud and proud barrage. Launching monumental silver tourbillion spinners into the night sky. With massive red blink dazzling strobes. Can you command and conquer this thunderous 1.3g effect barrage? The Conqueror barrage contains 35 huge and masterful created shots. With its unusual firing pattern between straight and fanned shots. With banks of two colour wave willow with red strobes and white blink. Before evolving into silver and gold wave willow with colour stars of green, red and blue blink. Finishing with golden titanium palm tails and chrysanthemum breaks. 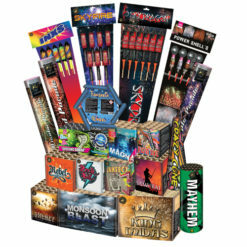 Have your event howling with joy with our wild paced 100 shot barrage. Vast red, blue, white, green and crackling mines, with giant red, green, blue, white and crackling bouquets high above with a quickened finale. Duration 50 seconds. Got these for my 30th Birthday Party, and they were unreal. Mega noisy and filled the sky. 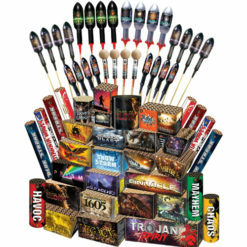 Deffo gonna get more for bonfire night. 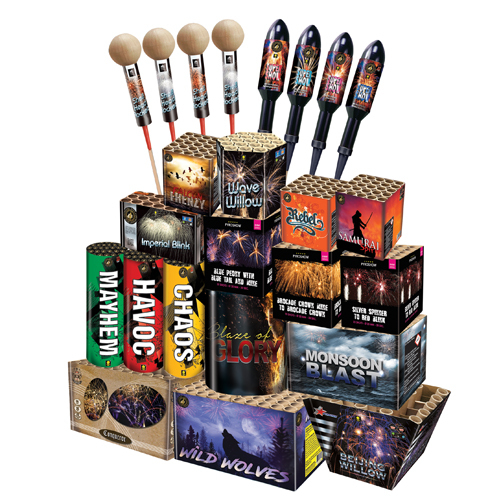 Get excited with the Pro Shop Giant pack crammed full of larger display fireworks. Designed to create a big impact high quality display. 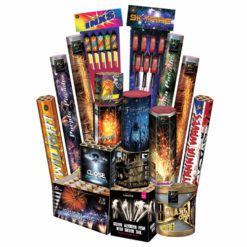 Another pack with mega cakes and barrages, in addition to awesome 1.3g effect rockets. 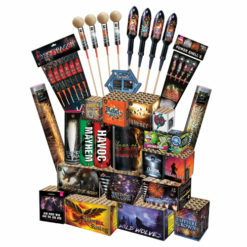 For those wanting less fireworks but bigger bang! On top of saving £166 off our already discounted prices! 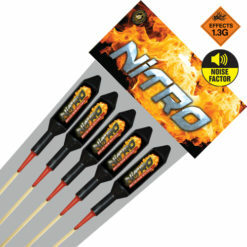 This pack includes your safety goggles, gloves and safety lighting portfires. 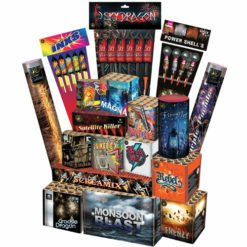 Plus a firework safety guide to help you have a safe and success display.